The rules of the cleanse is actually really simple, afterall, their motto is "We Think, You Drink". Since 8 PM was usually the time that I had dinner, having the Cashew Milk at 8 felt right to me for when I would drink my "dinner" drink of the night. There are some additional no-no's on the cleanse, besides food. The first is coffee and caffiene. The second is seltzer since it adds gas to your system. The third is chewing gum since the action of chewing also adds gas to your system as well as confuses your digestive system to prepare for food that you're not going to eat. So, just try to drink a ton of water and juice on the cleanse! 1) I would be so so hungry. 2) I wouldn't have enough energy to work out. 3) I would be really tempted to cheat and might break the cleanse. Not really knowing what to expect other than experiences from friends, I actually started become very excited to finally try the cleanse for myself. After all, not eating solid food for four days sounds like the ultimate challenge right? I started off the day by going to Fairway Market to buy the day's worth of supplies for myself and my coworkers since I actually failed to order the Fresh Direct in time. Excited to finally try the cleanse, I dragged the 13 juices - 4 each of the three I needed to order, and the BluePrint Green Juice so I could compare the taste to the one we have at work - down to the office. Not a stranger to Green Juice, my initial thoughts to the BluePrint version is that it's REALLY REALLY sweet. It contains 25g of sugar - which adds up considering you're drinking 3 of these a day. However, if you're not used to drinking green juice, I feel the BluePrint version is very palatable, and would probably make it easier to stomach as the days went by. Since it's been so busy at work, time flew before I had to drink my next drink at noon. Then, not too long after the Pineapple, Apple and Mint juice, it was time for another green juice. Honestly, it was really helpful to have been that busy at work because I didn't even think twice about the fact that I skipped lunch. Question to Self #1: How often do I eat because it's time to, and not because I'm actually hungry? Also, it was fun for me to have organized this for my coworkers since I felt like I was responsible for the well-being of a few other people. Every two hours I was passing out the next juice to everyone - which is how I got dubbed as the official Juice Mom at work. With the responsibility of being the Juice Mom, in addition to my heavy workload that day, the day flew by. 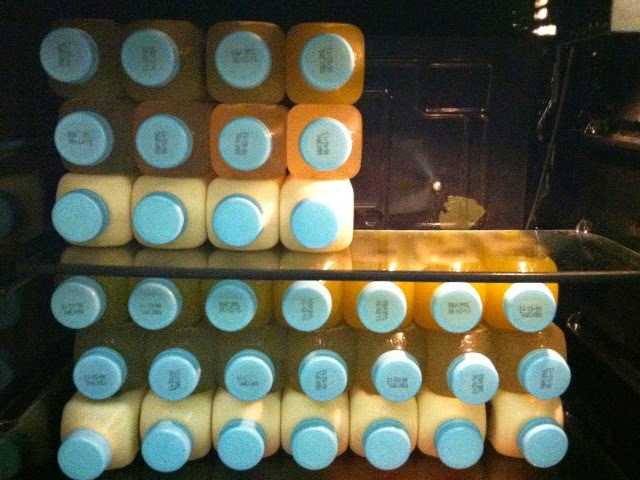 And since we had to drink so many juices back to back to back, I felt surprisingly full the whole day! Towards the last 2 juices, I actually felt like I had to chug my juice so I could start on my next one on time. Another observation that I made was how early I became tired and sleepy. That night, I fell asleep by 10:30PM, (as opposed to sleeping at 12:30-1AM)...which, I'd have to say, isn't the worst thing right? You get more rest on the cleanse. Also might be because you cut out caffeine (true for my coworkers, not for me, I rarely drink coffee). I said it earlier, but I'll say it again. Doing the cleanse with friends/coworkers is probably a lot more fun than doing it yourself. In the morning when I got into the office, I started to compare notes with my fellow-cleansers. Which juice was the favorite? All the juices actually are really good, but the Cashew Milk at the end of the day tasted like a dessert/milkshake. The Cashew Milk is the only juice that's a bit thick because it's made by blending soaked cashews. Not really, everyone is pretty full from the juices. Just think about snacking sometimes out of habit, not out of necessity. Did everyone sleep earlier last night? Ready to give up yet? As the day continued, juice after juice, I found myself still looking forward to all the non-green juices. I liked alternating the juices because it gave a bit of variety and gave me something to look forward to. Question to Self #2: How often am I using food as a past time and out of procrastination? A huge perk of doing the juice cleanse was how alert and concentrated I felt while working on my projects. Partly because I wasn't spending time obsessing about what I would eat for lunch or for snacks, and partly because my brain felt lighter and was full of clarity. Was it because I wasn't food coma-ing? Maybe. Later that night, I had to run some errands. So, in true New Yorker fashion, I walked the half mile from work to the Container Store and Bed Bath & Beyond so I could pick up some things for my apartment. It was 8PM, so time for my last dinner drink. Good thing I could bring my dinner to go. Within 5 minutes of my first stop, I started noticing how exhausted I felt trying to shop. Even though I wasn't starving, I could say that the all juice cleanse was starting to take a toll to my energy levels. By the time I hit up Bed Bath & Beyond, I didn't even want to look at anything, so knowing that I wasn't going to be productive, I opted to hop in a cab right away so I could get home as quickly as possible and sleep. Day 3 - Thursday - More than halfway through! The day started out as the previous. Except now I'm waking up a lot earlier than I normally do, probably because I slept so early! Still not starving, but definitely was looking forward to my first juice of the day. Later that day, I had to confront one of the biggest challenges of the cleanse: real life. One of my fellow cleansers, P, messaged me in the morning to tell me about her cleanse dilemma. Her clients had a lunch meeting last minute at noon, and she is wondering if she should just eat a small salad to avoid looking weird in front of the clients. As juice mom, I urged her to just drink the juice, or say she's not hungry. But, if it made her feel truly uncomfortable, she COULD just eat a small salad or drink a small cup of soup. A few hours later, another coworker messaged me, and informed me that I actually had to go to the same lunch meeting as P. Since I'm pretty shameless, I decided that I would not break the cleanse and just explain to my clients that I'm on a juice cleanse. And since I had P with me at the same meeting, I convinced her to skip the salad she was planning on, and just use the cleanse as a conversation starter with my clients. Crisis diverted. No cleanse broken here. Luckily, cleanses are so trendy these days that our clients didn't even think too much of our not eating lunch. The worst part of the whole thing was just that we had to stare at our clients while they were chewing and putting food in their mouths. However, if you were to hear my client's side of the story, they would tell you that it feels a bit weird to eat in front of people who aren't eating as well, but overall, it was no bigs. Up until this point, I have actually avoided food altogether so that I could resist temptation. So, seeing and smelling the food was definitely a bit torturous. Knowing that it would all be over soon was the only thing that kept me going. First and foremost, I have to say that the BluePrint Cleanse is usually only a 3 day cleanse, but since I ate like a gross slob on Monday night, I figured doing an extra day wouldn't be too much harder, and wouldn't hurt. By Friday, I really thought that I would feel enlightened, or cleaner, or something. But nope, to my surprise, I felt pretty much the same. True, I had not been eating solid foods for a few days now, but overall I wasn't hungry at all. Sure, I missed chewing food and looked forward to chewing the chunks of settled cashew at the bottom of my Cashew Milk (eww!) but overall, I felt pretty much the same. So at lunch, I decided to have a salad to ease back into food so that my weekend wouldn't be such a shocker. The sensation of chewing and eating was much welcomed. However, this is where it starts becoming clearer and clearer to me how much Food is just a Mind Game. Here I was, eating a plate of salad with a bit of lean protein (grilled chicken). Sitting in my fridge I knew was my Noontime Pineapple Apple Mint Juice waiting for me. In my head, I KNEW that if I had the P.A.M juice, and then the green juice at 2pm, I wouldn't actually be all that hungry. But here's the kicker, eating the salad left me feeling full, yet...mentally I still felt hungry! This is where studies about food and how it affects your brain comes into play. Having read the NYT article about The Extraordinary Science of Addictive Junk Food, I know that there are different flavors and textures of food that makes you craving for more. Also, it's been proven that it takes your brain about 20 minutes to realize that you're hungry, after your body's had enough. Two years ago when I started thinking about doing a cleanse, I concluded (without having done any of the cleanses before) in my comparison post, The Clean Program vs Master and BluePrint Cleanse, that the BluePrint Juice Cleanse wasn't really for me. There's always that shock factor when you tell 90% of the population that you're doing a Juice Cleanse - "What!? No food for 3 days?? How this this possible? You're nuts, I could never do that!". Then we have the other 5% of people who've actually done it and have quit mid-way. From the sound of it, I've heard about a few friends doing it for about 2 days before they stuff a candy bar in their mouth (I've actually had a friend do this, LOL). Then we probably have another 5% of people who have done it and lived to tell about it. When I began, I'd have to say that I was a part of the 90% who didn't believe. However, now I'm happy to say that I'm in the group of those who've done it and am writing to you now about my experience. Now if you asked me, would I do it again? My answer is No, I won't be doing the BluePrint Cleanse again. I don't know what to expect on the cleanse. I recall thinking that I would have to go to the bathroom a lot, and yes this was true, but not for the reason I originally thought. Drinking that much liquid just meant I had to pee a lot. For some reason when I read other people saying they had to go to the bathroom a lot, I thought it was for something else, if you know what I mean. Maybe I thought this would be some type of magic bullet that would jumpstart a healthier lifestyle. (It did not). But without the dedication and personal commitment to live a bit healthier, I don't think doing the BluePrint Cleanse would help with much. It makes you think more about the food you eat. Both my coworkers and I agree that the best takeaway from this cleanse was actually seeing and feeling how little food you need to feel "full". It made me realize just how much we eat out of habit and not from hunger. I thought for sure I was going to be starving by the 3rd day if not the very first day! But honestly, I really didn't feel like I needed to eat. So really, like I mentioned before, this cleanse makes you realize just how much of a mind game food really is. We think. You Drink. The BluePrint model is that they take all the hard work out for you. All you have to do is pay up and drink the juices. Or if you're like me, you can try to figure out a few days to cut costs. Either way, since it's such a strict formula for what you drink everyday, it really takes the temptation away for me. Suffer if you're constantly on the go. I have a pretty easy job in that I go to the office, sit at my desk all day, and barely have to do anything too physical besides hop on the subway and walk up and down flights of stairs to go to different meeting rooms. If you're in a position where you're constantly moving, for example, if you had children to take care of, I could imagine how much of a toll this would take. I was already exhausted by 10PM every day, and I only had to take care of myself. I don't think the BluePrint cleanse would be good for anyone who's day to day requires a lot of action. Don't feel much healthier afterwards. While I enjoyed this overall experience, I didn't feel like I gained too much from being on a juice cleanse for 3 days. Of course, it was much better than if I had spent three days eating junk food, but I wouldn't do it again. 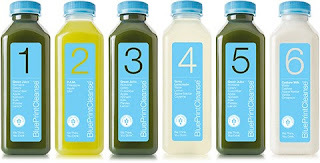 I know some people swear by the juice cleanse, but like a lot of fad diets, the BluePrint juice cleanse seems to just put a quick bandaid on months and years of unhealthy eating. 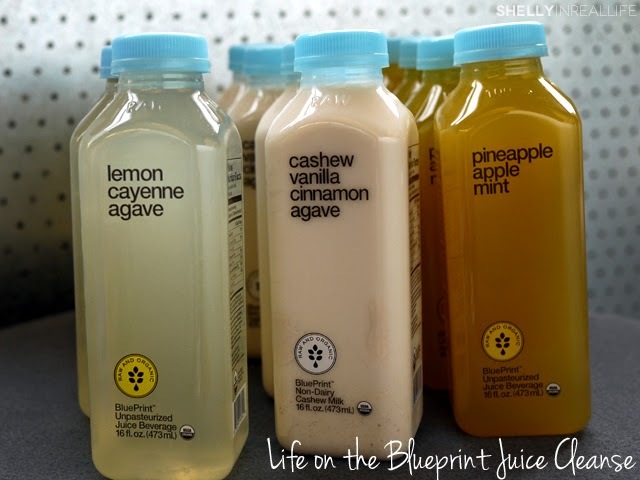 If you haven't been too healthy before this cleanse, the Blueprint Juice Cleanse probably won't help you become THAT much healthier after. With all that said, I'll go ahead and make a quick plug for what remains to be a cleanse that works for me, the Clean Program. Helps develop a foundation of healthier living. Because the Clean Program lasts for 3 weeks, you are forced to develop habits and skills that you can use in the future. Whether it's trying a new recipe you wouldn't have before, or discovering new healthier restaurants to eat at while you're out so you can eat cleaner. Left with tons of energy on cleanse. Because you're having liquid/smoothie breakfasts and dinners as well as solid foods during lunch, you're provided with different types of nutrients that you'll need to last you through the day. On the Clean Program, I never felt exhausted like I did during the BluePrint Cleanse and was able to work out consistently. Working out is very important to me, so being able to do this and cleanse is a huge positive. If you've read to this part of my post, then I must congratulate you since I know this is probably one of the longest posts I've written. I wanted to give you my honest feedback about the BluePrint Cleanse. If you're thinking about doing any type of cleanse to take a step forward towards living a healthier lifestyle, then I really urge you to take the next step and go through with it! Please reach out to me in the comments below if you have any questions about this and I'd love to chat with you about it! 'Till next time!